A Game About Soup. Because Soup Is Nasty Business. In space, soup is a nasty business. You’ll need to build bases that defend automatically themselves from attackers and jump your way to remote locations for out-of-the-ordinary ingredients. But, even in the far future of Pixeljunk Inc., people need their stews. You can tell just by looking at it that Pixeljunk Inc. is going to be different. The sixth games from Japanese indie dev studio Q-Games has a cute-abstract art style that recalls old-school arcade games but also looks like children’s book illustrations with a pop art feel. Artist Yoshi Yamamura said that he was using flat colors to try and channel the look of older manga comics from the 1950s and 1960s. But, after playing the game at PAX Prime a few weeks ago, I can say that the title’s gameplay’s even more intriguing than its looks. I've loved Q-Games' previous Pixeljunk games for the way they've experimented with preconceived notions of what a game in a particular genre is supposed to be. Pixeljunk Eden boiled platforming down to a vivid, minimalist core, Shooter threw in clever fire-and-water mechanics into familiar sidescrolling action and 4 A.M. was a trippy experiment in virtual music-making. Inc. fuses tower defense elements with resource management and Metroidvania action platforming into an odd, unique design mix. 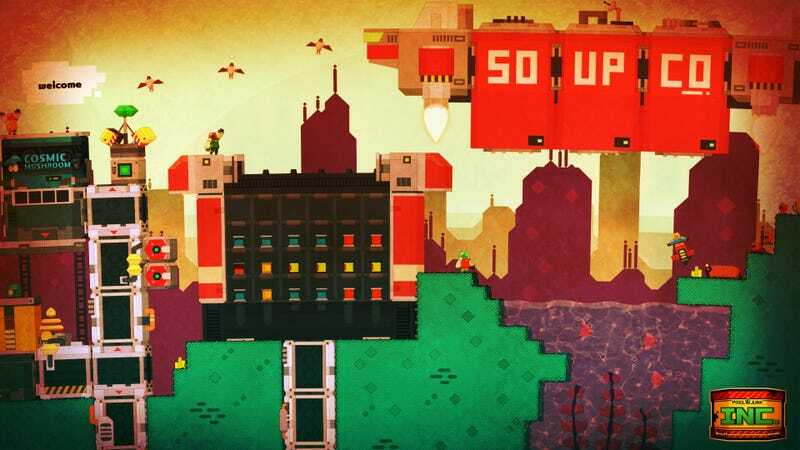 Players work for an intergalactic soup corporation and need to build outposts on randomly generated planets to export their product and harvest ingredients to keep on making more soup. Each world has its own hazards that will present different challenges. For example, you’ll need to dig underground and do most of your adventuring in caverns on a world with a poisonous atmosphere. And as you build the bases of operations, native lifeforms will swarm the structures and try to take them down. You’ll be armed with a laser that lets you mine the environment and aim attacks at the odd beasts trying to kill you. Oh, and those same creatures can be used for ingredients in your product, too. Those structures might be the most fascinating aspect of Pixeljunk Inc. They’re completely modular and customizable according to your whims (and cashflow). You can graft giant antigravity elevators onto each other next to rooms that crank out various resources that you need to make the all-important space soup. A bigger structure means more profit but will also be harder to defend. Smaller buildings are easier to protect but you’ll have to travel from one to another to keep things running smoothly. All the while, you’ll be hunting for the exotic recipes that will net more cash. Of course, getting ingredients for those recipes involves more risk. But maybe you’ll decide to finally unlock and deploy soup robots to shoot enemies and harvest space mushrooms. Or you could build a clone factory to cut down on legwork. The point is, Pixeljunk Inc. offers a wealth of interesting options and an intriguing backdrop for its vision of executing mindless corporate greed. You’re in charge, however you want to be. The game is being developed exclusively for Steam, with PC, Mac and Linux versions planned. There’s no release date yet but this looks like home cooking that’ll be worth waiting for.